Different classes of isomers and their organization. In chemistry, isomers are molecules that share the same chemical formula but differ in the arrangement of atoms. (Isomers in chemistry should not be confused with nuclear isomers, corresponding to atomic nuclei that share the same atomic number and mass number but differ in their energy states.) Often, there are only minor differences in the structures of the molecules, and the isomers therefore exhibit similar properties. In biological systems, certain isomers are more active than others. Isomerism was first noticed in 1827, when Friedrich Woehler prepared cyanic acid and noted that although its elemental composition was identical to fulminic acid (prepared by Justus von Liebig the previous year), its properties were quite different. This finding challenged the prevailing chemical understanding of the time, which held that chemical compounds could be different only when they had different elemental compositions. After additional discoveries of the same sort were made, such as Woehler's 1828 discovery that urea had the same atomic composition as the chemically distinct ammonium cyanate, Jöns Jakob Berzelius introduced the term "isomerism" to describe the phenomenon. In 1849, Louis Pasteur separated tiny crystals of tartaric acid into their two mirror-image forms. The individual molecules of each were the left and right optical stereoisomers, solutions of which rotate the plane of polarized light in opposite directions. Note that the position of the oxygen atom differs between the two: It is attached to an end carbon in the first isomer, and to the center carbon in the second. The number of possible isomers increases rapidly as the number of atoms increases; for example the next largest alcohol, named butanol (C4H10O), has four different isomers. In the above example, all the bonds in both isomers are single covalent bonds; there is no type of bond that appears in one isomer and not in the other. Also, the number of bonds is the same. From the structures of the two molecules, it can be deduced that their chemical stabilities are liable to be identical or nearly so. There is, however, another isomer of C3H8O which has significantly different properties: Methyl ethyl ether (III). Notice that unlike the top two examples, the oxygen is connected to two carbons rather than to one carbon and one hydrogen. As it lacks a hydroxyl group, the above molecule is not considered an alcohol, but is classified as an ether. Its chemical properties resemble those of other ethers, rather than the properties of the above alcohol isomers. Another example of isomers having very different properties can be found in certain xanthines. Theobromine is found in chocolate, but if one of the two methyl groups is moved to a different position on the two-ring core, the isomer is theophylline, used as a bronchodilator. There are two main types of isomerism: Structural isomerism and stereoisomerism. In structural isomers, the atoms and functional groups are joined together in different ways, as in the example of propyl alcohol above. This group includes chain isomerism, whereby hydrocarbon chains have variable amounts of branching; position isomerism, which deals with the position of a functional group on a chain; and functional group isomerism, in which one functional group is split up into different ones. In the case of stereoisomers, the bond structure is the same, but the geometrical positioning of atoms and functional groups in space differs. This class includes enantiomers, where different isomers are mirror-images of each other, and diastereomers, where they are not. 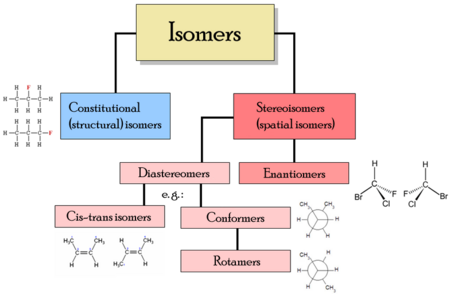 Diastereomerism is again subdivided into conformational isomerism (conformers) when isomers can interconvert by chemical bond rotations and cis-trans isomerism when this is not possible. Note that although conformers can be referred to as having a diastereomeric relationship, the isomers over all are not diastereomers, since bonds in conformers can be rotated to make them mirror images. In food chemistry, medicinal chemistry, and biochemistry, cis-trans isomerism is always considered. In medicinal chemistry and biochemistry, enantiomers are of particular interest since most changes in these types of isomers are now known to be meaningful in living organisms. Pharmaceutical and university-level researchers have found chromatographical methods to reliably separate these from each other. On an industrial scale, however, these methods are rather costly and are mostly used to filter out potentially harmful isomers. While structural isomers typically have different chemical properties, stereoisomers behave identically in most chemical reactions. Enzymes, however, can distinguish between different stereoisomers of a compound, and organisms often prefer one stereoisomer over the other. Some stereoisomers also differ in the way they rotate polarized light. There are some additional types of isomerism as well, but they are beyond the scope of this article. For instance, topological isomers, or topoisomers, are generally large molecules that wind about and form different shaped knots or loops. Molecules with topoisomers include catenanes and DNA. Topoisomerase enzymes can knot DNA and thus change its topology. There are also isotopomers or isotopic isomers that have the same numbers of each type of isotopic substitution but in chemically different positions. In nuclear physics, nuclear isomers are excited states of atomic nuclei. In the case of structural isomers (or constitutional isomers), their molecules have the same molecular formula but the bonding of atoms takes on different arrangements. Three categories of constitutional isomers are: Skeletal, positional, and functional isomers. In skeletal isomerism (or chain isomerism), components of the (usually carbon) skeleton are distinctly re-ordered to create different structures. For example 3-methylpentane is a chain isomer of 2-methylpentane. Pentane exists as three isomers: N-pentane, isopentane, and neopentane. In position isomerism, a functional group changes position on the chain. In the diagram, pentan-2-ol has become pentan-3-ol. Many aromatic isomers exist because substituents can be positioned on different parts of the benzene ring. Only one isomer of phenol or hydroxybenzene exists but cresol or methylphenol has three isomers where the additional methyl group can be placed on three different positions on the ring. Xylenol has one hydroxyl group and two methyl groups and a total of 6 isomers exist. In functional group isomerism, a functional group splits up and becomes a different group. Here is an example of functional group isomerism: Take cyclohexane, C6H12 and 1-Hexene, also C6H12. These two are considered functional group isomers because cyclohexane is an alkane and 1-hexene is an alkene. Both must have the same molecular formula. Stereoisomers are isomeric molecules whose atomic connectivity is the same but whose atomic arrangement in space is different. Enantiomers are two stereoisomers that are related to each other by a reflection: They are mirror images of each other. Every stereocenter in one has the opposite configuration in the other. Two compounds that are enantiomers of each other have the same physical properties, except for the direction in which they rotate polarized light and how they interact with different optical isomers of other compounds. For this reason, pure enantiomers exhibit the phenomenon of optical activity and can only be separated with the use of a chiral agent. In nature, only one enantiomer of most chiral biological compounds, such as amino acids, is present. As a result, different enantiomers of a compound may have substantially different biological effects. Diastereomers are stereoisomers not related through a reflection operation; they are not mirror images of each other. These include meso compounds, cis-trans (E-Z) isomers, and non-enantiomeric optical isomers. Diastereomers seldom have the same physical properties. In the example shown below, the meso form of tartaric acid forms a diastereomeric pair with both levo and dextro tartaric acids, which form an enantiomeric pair. Traditionally, double bond stereochemistry was described as either cis (Latin, "on this side") or trans (Latin, "across"). (The terms cis and trans are also used to describe the relative position of two substituents on a ring; cis if on the same side, otherwise trans.) Due to occasional ambiguity, IUPAC adopted a more rigorous system wherein the substituents at each end of the double bond are assigned priority numbers. If the high priority substituents are on the same side of the bond it is called the "Z" isomer (from the German word zusammen, meaning "together"). If they are on opposite sides, it is called the "E" isomer (from the German word entgegen, meaning "opposite"). An example of double bond stereoisomerism is 1,2-dichloroethene, C2H2Cl2. Molecule I is Z-1,2-dichloroethene (chlorines on same side—the top) and molecule II (chlorines on opposite sides) is E-1,2-dichloroethene. There is no way of "superimposing" the structures on each other through bond rotation. Therefore, they are two different molecules. In contrast, for 1,2-dichloroethane, C2H4Cl2, which is similar except that it has an extra H attached to each C and a single bond, the E- and Z- forms do not exist. Since the carbon atoms can rotate around the single bond, in a flat projection of the molecule, all three atoms attached to one carbon could swap places and still represent the same structure. Configurational isomers are diastereomers and can possess different physical, biological and chemical properties. Conformational isomerism is a form of isomerism that describes the phenomenon of molecules with the same structural formula having different shapes due to rotations about one or more bonds. Different conformations can have different energies and can usually interconvert. As a result, they can rarely be separated from one another. For example, cyclohexane can exist in various conformations, including a "chair" form and a "boat" form, but these cannot be separated, not least because a boat conformation represents a transition state when a molecule goes from one chair form to another. Some molecules can be isolated in only one conformation, due to large energy barriers between different conformations. All links retrieved March 7, 2018. Clark, Jim. "Structural isomerism" Chemguide. Compendium of Chemical Terminology, stereoisomerism. Compendium of Chemical Terminology, geometric isomerism. This page was last modified on 7 March 2018, at 23:53.